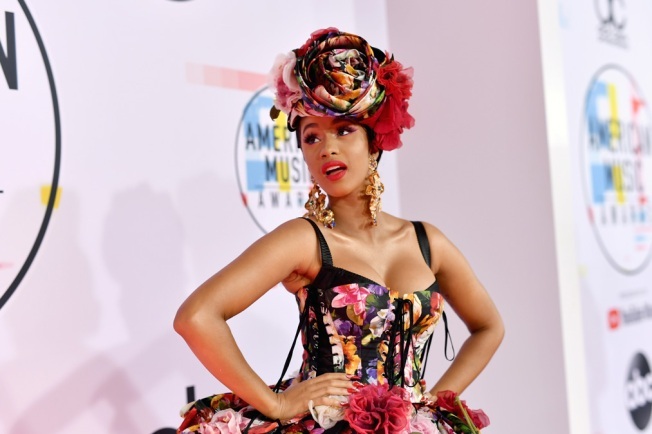 Cardi B attends the 2018 American Music Awards at Microsoft Theater on October 9, 2018 in Los Angeles, California. Cardi B and Post Malone marked major breakthroughs in the last year, but the rap stars won't compete for best new artist at the 2019 Grammy Awards. Cardi B, who earned two nominations at this year's Grammys held in February, was not eligible for nomination because of her previous nominations. The Grammys, which has adjusted the rules of best new artist over the years to keep up with the changing musical landscape, state that "any artist with a previous Grammy nomination as a performer" would not qualify. If Cardi B had not released an album around the time she earned her first pair of nominations for "Bodak Yellow," she could have qualified. But because she had enough music to be eligible for best new artist at the 2018 show and earned prior nominations, she was not qualified to enter the category. A person familiar with the situation, who spoke on the condition of anonymity because they were not allowed to publicly discuss the topic, said Cardi B was submitted for best new artist at this year's show, though she didn't earn a nomination. The award went to Alessia Cara, while nominees included SZA, Khalid, Lil Uzi Vert and Julia Michaels. Post Malone was also submitted for best new artist at this year's show but didn't garner a nomination. Because he had never earned a Grammy nomination, he met the criteria to be a best new artist contender for the upcoming awards show, but at a Grammy nominations meeting held this month his inclusion in the category was met with debate, the person said. Malone lost in a vote by music industry players — ranging from executives to producers to publicists — and will not compete for the coveted honor. Some felt because the hitmaker had success with his 2016 debut, "Stoney," as well as the hit songs "Congratulations" and "White Iverson" — released in 2015 — he had already past new artist status. Malone was also a hot topic at the Grammys meeting for his recent album, "Beerbongs & Bentleys," which was kicked out of the rap category and pushed into the pop genre, the source said. Best rap album nominees must contain 51 percent or more of rap music, and the Grammys rap committee felt "Beerbongs" leaned more toward the pop genre with its the production, sound and melodies. The diverse album also includes singing, elements of R&B and rock and veers outside of rap with songs like the guitar-tinged "Stay." The person said the larger Grammys committee listened to the entire 18-track album — which includes the No. 1 hits "Rockstar" and "Psycho" as well as "Better Now," currently No. 4 on Billboard's Hot 100 chart — and voted that it would compete in pop instead of rap. It was not clear where Malone's singles would land — they could appear in rap or pop, or both. Over the years more and more musicians have had songs from a single album appear in different genre categories. Beyonce's "Lemonade" album had tracks compete in rock, pop, R&B and rap categories, while Justin Timberlake and Rihanna's nominations have ranged over the years from dance to pop to R&B to rap.